I haven't done anything new for the last couple weeks, which has been very bother some. I seem to be falling asleep too much, resulting in far less time to draw. With that said I have decided I am going to try drawing after work instead for the next week or so to see how it goes. With me working until the early hours of the night. and still having to get up by 8 to take my kid to school, I figure if I just stay awake until I take him to school I could possibly get 4 hours of drawing in a night and still have 5 to 6 hours of sleep before I have to get ready for work and pick up my kid from school. Since I am normally wired when I get home from work staying up shouldn't be a problem. And if I am tired at work, I know I should pass out when I get home and have a good 4 hours of sleep before getting up and my kid to school. Seems like a no brain er. The wife may not like it too much, but since I have been sleeping throughout the day anyways and I only have a 4 day work week, it won't be too much of a change. Just makes the honey do list longer on the weekends. Asides from that, I have been rethinking how I would like to print my future books. I am leaning towards getting away from the normal 20 to 22 page length comic and more towards a 48 page comic. I would like to get more of the story out at once plus printing one larger book is cheaper than printing 2 smaller books. Breaking the 48 page book into 2 chapters would give it more of a manga feel to it as well, but also give me the chance to try some short stories with other characters that I have been wanting to do for awhile. There may be a couple of other shows but as of right now I am not sure. 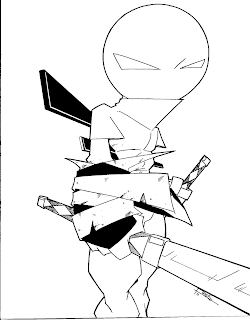 The plan is to have Centuri Way of the Ninja volume 2, as well as several new Paper Toys released for Emerald City. Hopefully all goes good. Well, that's it for now. No new artwork to show or paper craft, but I should to have some new artwork up this weekend.